Police also found several firearms near windows and doors in every room of the home. 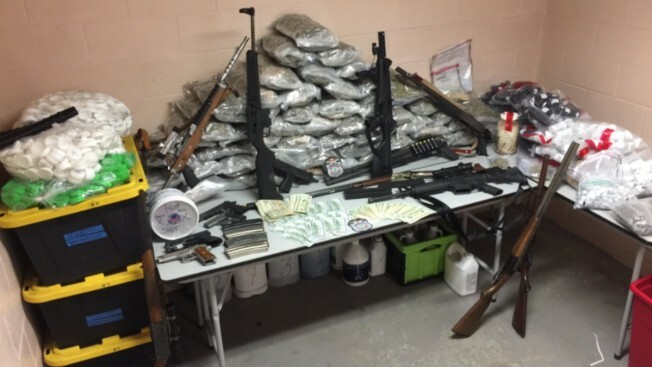 A fire in Seabrook led to a massive drug and weapon bust in New Hampshire. Authorities responding to a fire at a New Hampshire home say they found a significant marijuana growing operation and later arrested a resident who had called 911 and fled. Police said arrested 37-year-old Jonah Couturier, of Seabrook, on a marijuana possession charge following the fire early Monday. They say they seized more than 70 pounds of the drug, as well as some LSD, heroin, fentanyl and other drugs. It wasn't immediately known if he had a lawyer. Police say an attached garage had been converted into a "growing room" for marijuana that included storage for chemicals and other material. Police also found several firearms - including an Uzi - near windows and doors in every room of the home. According to the Newburyport Daily News, the drugs were worth about $280,000. More than $3,000 in cash was also found inside the home. Police said it was "a sophisticated growing, manufacturing and distributing operation."